How might we leverage public engagement to create more useful transit systems? Transit systems in mid-sized, car-centric cities will experience major changes in the next decades. More people are living in cities than ever before. Scaling up city services for this population growth is difficult for all public goods, but it presents an especially big challenge for transit because we have a finite amount of space and new infrastructure is costly. Environmental concerns aside, the 1950's highway-oriented world cannot scale to meet transit needs of the modern city. New ideas are emerging from the public and private sector about how to disrupt car ownership and provide reliable alternatives. However, with all the focus on creating transit for young urban professionals and affluent commuters, I was concerned with who was being left out. 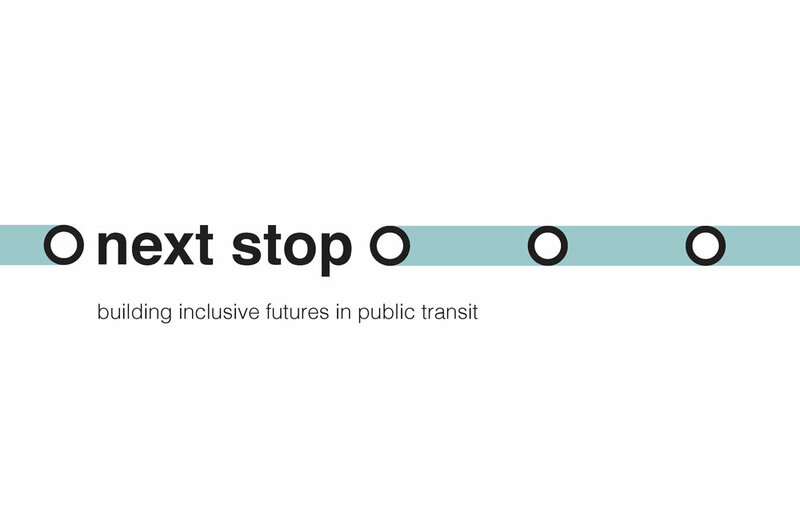 How can transit of the future be a tool for social equity and inclusion? How can public transit systems increase ridership without sacrificing service to less accessible parts of the city? How can we make buses appeal to choice riders without making existing riders feel abandoned and unwelcomed? With these questions in mind, I started doing research with urban planners and bus riders. 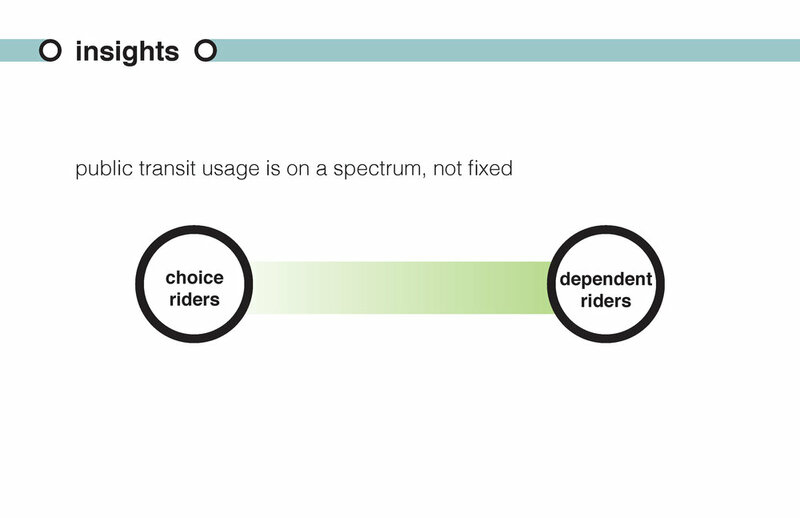 Choice riders and dependent riders are not mutually exclusive; ridership exists on a spectrum. If you create a system solely from the principle of equity, you won't be able to scale. 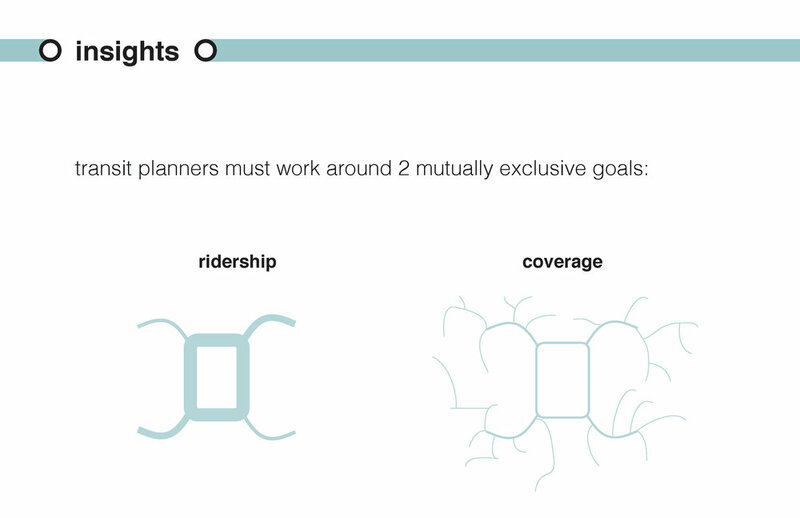 And a system that works at scale should be the primary goal of a transit planner. Your transportation cannot be more efficient than the underlying architecture of the city. Planners, more so than anyone, want to make inclusive systems, but they struggle with how. Public engagement forums should ideally be a way to co-design, but they don't know how to make the general public a part of their decision-making process. Instead, public forums are a box to check, were the audience is an obstacle, instead of a partner. In the words of the excellent Jarrett Walker, if you want to help the general develop informed opinions about complex transit systems, "convene them in the presence of geometric fact." Give people something known, that they can experience together then build upon. With those insights in mind, I set out create an object that could support better conversations in a public engagement meeting. The final gumball machine inspired object has 6 interchangeable canisters representing different ways to use a street lane: parking only, private car only, private and ride share, private car and bus, bus rapid transit, and ride share only. Each canister dispensed balls representing riders or drivers at different rates depending on their efficiency. The balls were color coded for what form of transit that person took: blue for bus, orange for private car, and gren for ride share. By turning the wheel, you could see how many of what kinds of transit riders could move through the street over time.